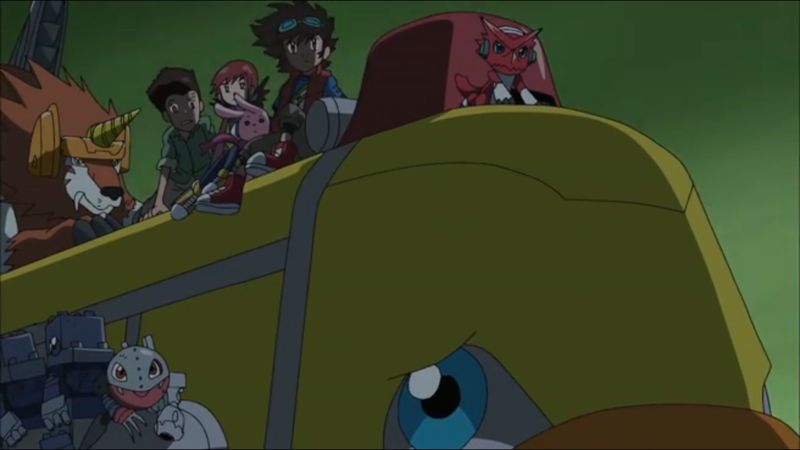 Digimon: System Restore: Fusion Episode 20: Train Of Terror! With three generals that aren't necessarily going to be together all the time, we're set up well for episodes that split time between them. We almost got a taste of that last time, but there was too much going on in the sanctuary to show much of Kongoumon losing to what amounted to the Fusion Fighters' second string. This episode technically achieved this, showing us Mikey's exploits in the Dust Zone and Christopher's pivotal encounter with AxeKnightmon. Only thing is, Christopher's action was the only thing that mattered, and it was over in one scene. It makes the analysis of the scene quite simple: Christopher is a gullible moron. 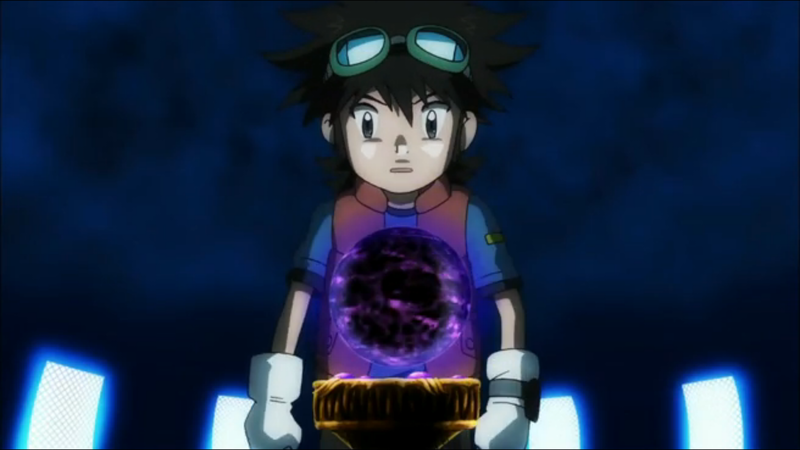 He goes to AxeKnightmon looking for a coalition, and is told to put his hands on the scary orb of darkness. And he actually does without asking questions! He fell for the oldest trick in the book! What is with you man, come on! At least when Mikey did it, he was thinking it was to save Nene. Blame that on the goggles. But we expect better from Christopher, especially since unlike Mikey, he does have some darkness in his heart. The brief images we got out of his head last episode included a young Christopher staring forlornly at a picture of his parents. Historically, that's not indicative of a cheery backstory. Actually, why doesn't Mikey have any darkness in his heart? Are we supposed to believe that he's totally clean? We're certainly no stranger to flawed heroes, and it's a key part of what makes Digimon so enjoyable. No character is completely untainted. Mimi and TK started out clean, but the course of their adventures took care of that. And while Davis may not have had any darkness in his heart (which kind of annoyed everybody), he had character deficiencies to make up for that. Mikey doesn't even have those, so to say that he has no darkness only makes him seem boring. Perhaps what's so irritating is that at the same time Mikey is said to be totally in the light, this urge to help that the episode treats as second nature comes from a dark place. Even if the consequences of him not helping that boy with the soccer ball are diminished in the dub, the black spot on his conscience isn't. 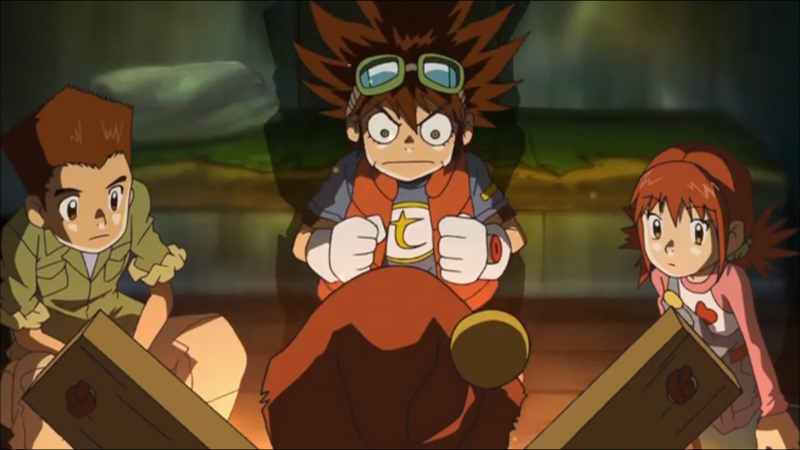 Judging by his reaction to Puppetmon's plight, it's almost pathological, Welcome to the NHK-type stuff. Without his Fusion Loader, he's not in a much better position than Puppetmon, but he still shakes at the opportunity. Angie (whose dark side we've already seen) and Jeremy (Lord knows what's wrong with him) have to explain that he's in equally dire straits. The weird thing is that all Mikey really does is convince the locals to go after the actual bad guy instead of each other. In this world, GranLocomon dominates the land by squandering oil and forcing everybody else to fight over resources that they can trade in for it. It's all very Hunger Games, and may even be a jab at a few countries that won't be named. But how long has this been going on that the mere concept of teaming up to take him out is so utterly foreign? The Garbagemon and ToyAgumon work together to gather mecha; challenging GranLocomon shouldn't be that unfeasible if they make the right friends. Once Mikey gets his Fusion Loader back, the king is dethroned easily enough. But he had to do very little to get to that point; a combined effort from all the locals may have achieved the same thing. In all, it's a pretty shallow story. A foreigner comes in, preaches teamwork and trust, and everybody gets the message and gets the job done. It covers similar ground as Magma Zone and it and the whole “no darkness” thing makes Mikey a little too saint-like for comfort. At least Christopher working for AxeKnightmon is a new development. Man, all these alliances are getting a bit crazy; if only there was an amusing chart before every episode summarizing where everybody stands. There was some serious discontinuity after Garbagemon showed up. One minute, they're exchanging threats, the next they're shielding themselves from a steady attack. Such is the power of one tiny edit. Nice to see the Trailmon from Frontier again! Kettle was always underrated and we got glimpses of Worm and Buffalo as well. Only problem is that while the Trailmon ran on unique monorail tracks in the Digital World, Locomon was seen to run on standard human world rails in the second Tamers movie and the conversion to Trailmon tracks is awkward. Puppetmon calls the Junk Zone home for antiquated relics like cassettes and floppy disks. Floppy disks were still in full force when the first season aired. Apparently Akari's line about Pinocchimon's nose growing because he liked her was a little too evocative for the censors. It was changed to something about secret powers and while I can put up with the need to change it, you feel like they could have done better with that. Silly dub. Angie's secret power is having a gigantic novelty wrench hidden on her person. And what exactly did Jeremy do to make Trailmon go faster? Did he have some of Doc Brown's exploding logs stashed somewhere? In the Digimon Data Collection segment, Angie was dressed as Santa (with reindeer Monitamon) as the episode aired in December in Japan. Between stuff like that and the odd choices of profile (MegaKabuterimon and I am not spelling it Fusion's way), I could get behind a decision to rearrange which episodes these air in.